A seven-seat full-sized MPV, the Volkswagen Sharan is a big, spacious family hauler for those putting practicality first. Volkswagen's first foray into the MPV market - if you ignore the microbus - arrived back in 1995 in the shape of a joint venture with Ford. The Sharan shared a factory with Ford's Galaxy (as well as the Volkswagen Group's own SEAT Alhambra) and they've competed against each other for nearly a decade. Ford replaced the Galaxy in 2006, but the Sharan remained on sale until 2010 when it was replaced by an all-new model featuring sliding rear doors. A seven-seat full-sized MPV, the Sharan's a big, spacious family hauler for those putting practicality first. On sale for 15 years it's no surprise that the Sharan saw a number of technical and styling revisions throughout its lengthy production cycle. Introduced with a range of engines including everything from a 1.8-litre turbocharged petrol unit to the frankly daft 2.8-litre VR6 with the option of four-wheel drive, it'd be the 1.9-litre turbodiesels and 2.0-litre petrol units that made up the majority of sales in Ireland. 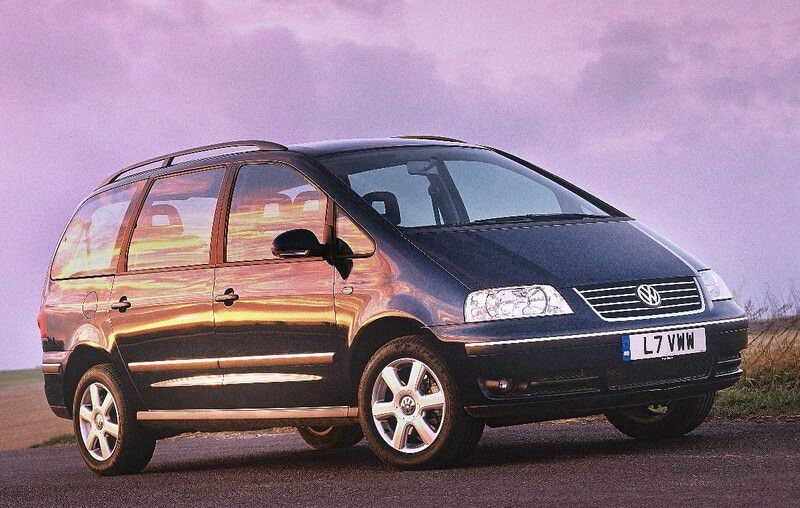 A major facelift was undertaken in 2000, seeing the Sharan get a new look (more squared off front lights and grille, new rear lights) bringing it more in line with Volkswagen's then current company look. The engine range was revised slightly too, a third, higher power 1.9 TDI joining the line-up - the TDI range offered in 90-, 116- and 131hp guises. Economy and emissions were improved across the range, as well. A further facelift was undertaken in 2004, this seeing the rear lights and grille changed, as well as a more comprehensive standard equipment list. The most powerful diesel had its power upped to 150hp, while a 2.0-litre TDI engine joined the line up late in the Sharan's life, it having 140hp. Manual and automatic models were offered, the manuals being the most commonly found in the classifieds. There's space for seven, with a small boot when the rear seats are in use. The rearmost pews are removable, but heavy. Unlike later, and many compact MPVs since, the six and seventh seats don't fold tidily away out of sight under the boot floor when not in use. There are three individual seats across the rear, these too tumbling and folding, as well as being removable. The interior feels of high quality, and exhibits Volkswagen's usual clear, easy to use functionality - highest specification cars featuring leather-covered seats. A desirable option to look out for if you have small children is the integrated rear child seats, which fold out of the cushions themselves. If the car does come with this, be sure the additional headrest buttresses are in the car, too. The 1.9 TDI was a big seller, for good reason, it providing a good mix of economy and performance. The 116hp model will suffice though, the higher output models fine if you find one in your budget, but the 116hp is a great all-rounder. A very commodious, practical family hauler with plenty of comfort for seven, the Sharan is a fine choice for those who value space and ease of use over everything else. Well worth a look.